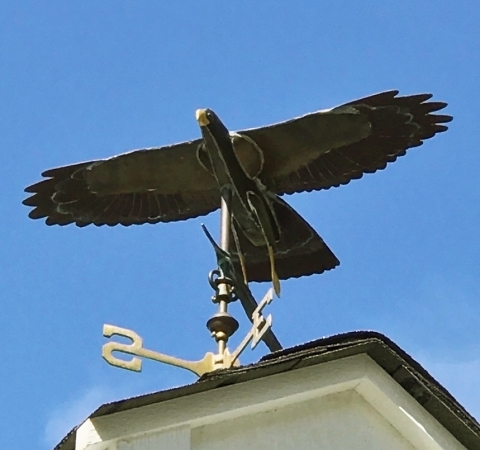 This Red Tailed Hawk Weather Vane, Buteo jamaicensis, catches the wind and appears to be soaring overhead. 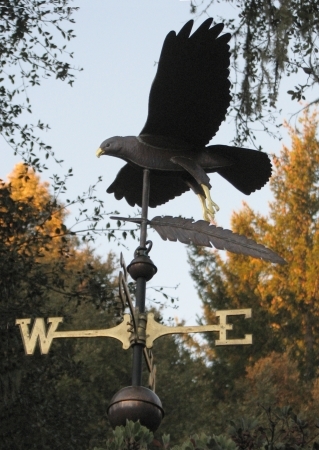 For this reason, this is one of the few designs we offer that is almost always displayed in a prominent position where you can look up and see it silhouetted against the sky, although you could certainly display it on a deck railing or in a garden setting as well. If you look closely, you can see finely textured details in the wings. 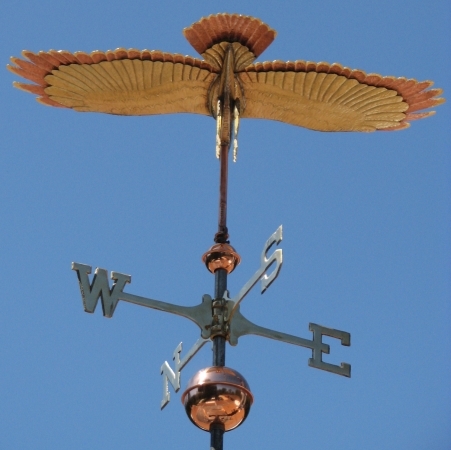 The bird’s body has been made in brass with copper wingtips and tail feathers. 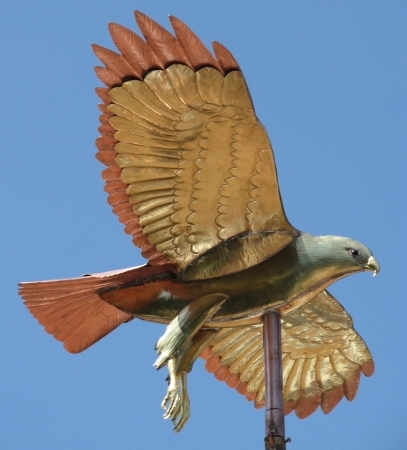 Optional gold leafing of the beak and talons offers a nice visual contrast with the weathered copper and brass. 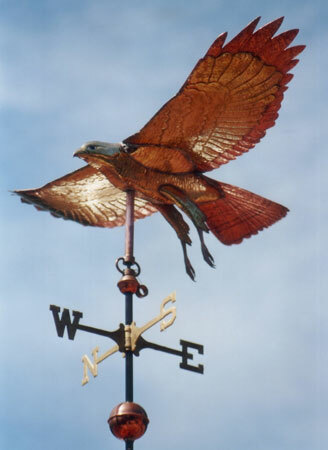 Our Red Tailed Hawk Weather vane is actually quite similar to our Red Shouldered Hawk Weather Vane. 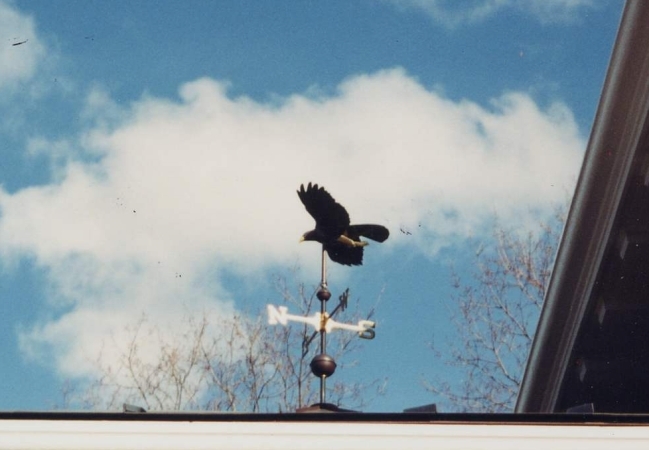 The primary difference between the two is the Red Shouldered Hawk’s very distinctive banded markings in its wings and tail when soaring. 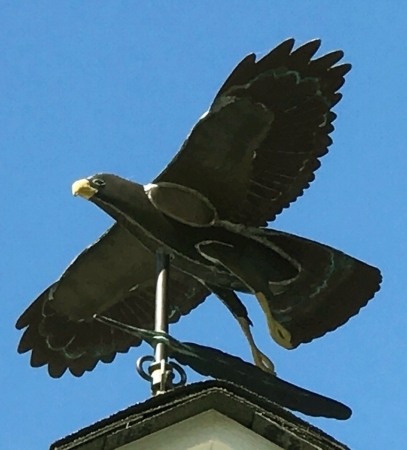 Therefore gold leaf is always included on the wings and tail of the Red Shouldered Hawk Weathervane to mimic these markings. 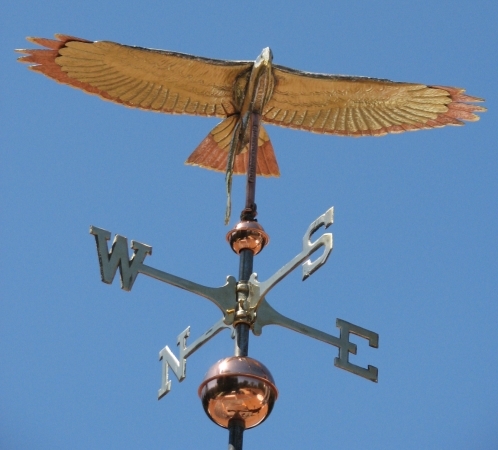 That is also the reason for the difference in the price between these two hawk weather vanes. And both of these stunning vanes are available with the addition of a beautiful feather sculpture piece below the soaring hawk. 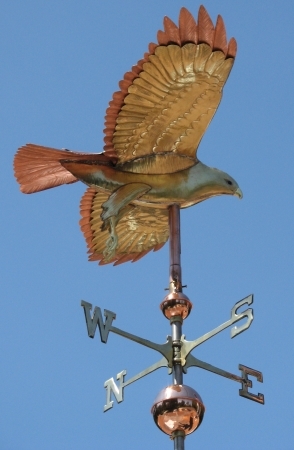 These Red Tailed Hawk and Red Shouldered Hawk Weathervanes, along with our airplane weathervanes, have outstretched appendages. 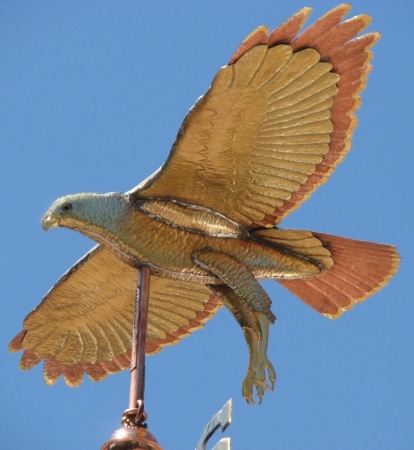 In high winds, you can actually get upward pressure on the sculpture piece, which necessitates the hawks, as well as the airplanes, come standard with a security device that allows the sculpture piece to turn freely but helps prevent it from rising upwards in strong winds.